Is Your Compounding Pharmacy Compliant? Complying with all the current compounding regulations can seem like a steep hill to climb for health facilities professionals. In an effort to increase patient safety, the U.S. Pharmacopeia has implemented USP 797 to control the compounding and administration of pharmaceutical products in the United States. The regulations comprising USP 797 are intended to protect patients by preventing the contamination of compounded sterile preparations. USP 800 has also been adopted to protect patients and pharmacy personnel from exposure to hazardous drugs as part of compounding. In addition to the U.S. Pharmacopeia, many state Board of Pharmacies have adopted their own regulations, that must be complied with. Trying to understand all of the standards that must be met, facility and budget obstacles that pose challenges to implementing the measures needed to be in full compliance, and uncertainty over what lies ahead make navigating all of the regulations very challenging. While it may seem daunting, health facility managers can achieve compliance with USP 797, USP 800 and Board of Pharmacy (BOP) regulations with the appropriate investment in planning, time and funding. Getting started now, understanding where a facility stands relative to the current and anticipated regulations, and engaging stakeholders in the process will ensure a facility’s full USP 797, USP 800 and BOP compliance. The U.S. Pharmacopeia Convention (USP) is a scientific, nonprofit organization that sets recognized national standards for identity, strength, quality and purity of drugs. USP 797 is a set of guidelines, procedures and compliance requirements for compounding sterile preparations (CSPs). Overseen by the Food and Drug Administration, USP 797 sets the legally enforceable standards that apply to all settings in which sterile preparations are compounded. All activities associated with preparing a sterile compound for administration to a patient fall under the regulation. While USP 797 sets federally enforceable legal standards, not all states have adopted regulations governing sterile compounding, and states that do have them have not always enforced compliance with the regulations. The facility-specific requirements of USP 797 are centered on establishing and maintaining a safe environment for preparing CSPs, patient-specific medications that must be prepared in a sterile environment and remain sterile when administered. Controls must be in place to limit the potential for contamination. At a minimum, hospitals must have a room physically distinct from the rest of the pharmacy; buffer and ante areas that may be separated by a line of demarcation with proper airflow; restricted access barrier systems (RABS, also known as glove boxes) may be located in unclassified air if certified by the manufacturer to maintain an ISO 5 environment inside; and a chemo hood/isolator, which in a hospital that produces a low volume of hazardous CSPs, is permitted to be located in a positive-pressure room. Hospitals also are required to certify primary engineering controls and test the air quality of the compounding area every six months. Compliance can be logistically challenging, time-consuming and expensive. Unlike other capital expenditures, investment in USP 797 compliance does not generate increased revenue for the hospital. In some instances, states that conduct inspections have allowed a gap analysis and a documented facility plan to serve as evidence that a hospital is moving toward compliance, making sanctions for noncompliance nonexistent. Additionally, the use of the word “should” in reference to several topics in the regulation created ambiguity as to whether an action was required or merely suggested. However, a growing number of states are adopting USP 797 regulations as laws, state boards of pharmacy have stepped up vigilance, and the USP has revisited its standards and issued revisions to more clearly state expectations of hospitals that engage in sterile compounding. The U.S. Pharmacopeial Convention’s (USP’s) newest chapter, USP 800, titled “Hazardous Drugs — Handling in Healthcare Settings,” was scheduled to be published Feb. 1 with a delayed official implementation date of July 1, 2018. The intent of USP 800 is to protect hospital personnel and the health care environment from exposure to hazardous drugs (HDs), and it sets standards for the safe handling of HDs, from receipt at the hospital to storage, compounding, dispensing, administration and, ultimately, their disposal. Under the new regulation, a hazardous drug is defined as a medication specified in the current National Institute for Occupational Safety and Health list of antineoplastic and other hazardous drugs. USP 800 replaces the hazardous drug section in revised USP 797 and, when published, will be the sole USP source of regulation on hazardous drugs. Like USP 797, the standards outlined in USP 800 are legally enforceable by the federal government and state boards of pharmacy. Health care settings that fail to be fully compliant face the possibility of financial penalties. 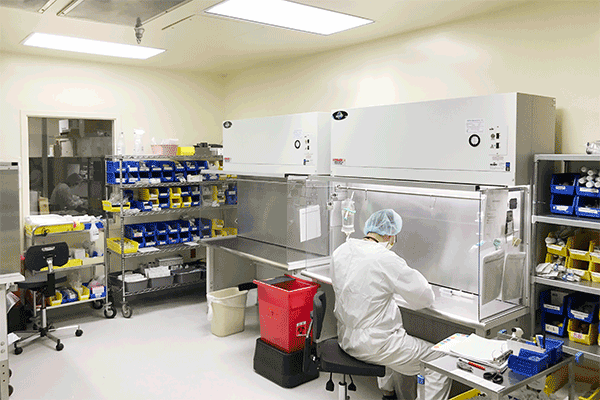 A biological safety cabinet (chemo hood) must be located in a negative-pressure room separated from all other compounding areas, regardless of the volume of hazardous drug compounding done by the hospital. There is no exception for low-volume compounding. Antineoplastic hazardous drugs must be stored in a negative-pressure room. The biological safety cabinet must be vented to the outside air, a recommendation under USP 797 that is now mandatory. While the enforceable date is less than two years away, taking steps now to put the processes, protocols and facility improvements in place will put the hospital out ahead. What used to be “proposed facility and environmental measures” are no longer a consideration for compounding pharmacy design but now a “must” for all hospitals that prepare sterile compounds, and there will be no exceptions. The proposed revisions are intended to leave no room for interpretation, setting specific and clearly articulated must-have requirements for engineering and environmental quality and control at all hospitals. The implications of these requirements vary by hospital. More established hospitals face physical plant and space limitations that will present extensive obstacles in achieving compliance and require dedicated financial and staff resources to overcome. The pharmacy’s remote location and the concrete block construction typical of older hospitals pose challenges to properly venting the compounding area and implementing the necessary HVAC upgrades. Moving walls and constructing a closed architecture for the compounding area could prove problematic given the limitations of existing buildings. Regardless of the obstacles, the revisions will impose a clearly defined time frame by which hospitals must achieve compliance with USP 797, intensifying the pressure to take immediate action and secure the financial resources needed to implement the necessary changes quickly. Any leeway hospitals believed they had under USP 797 disappears with the new revisions. A compounding facility generally consists of separate, designated operational clean areas, including an ante area, a buffer area and a primary engineering control (PEC), or a segregated compounding area containing a PEC where CSPs are prepared. All CSPs, except those for urgent use, will be required to be prepared in a PEC, which provides an ISO Class 5 environment. In addition, ISO 7 buffer and ISO 8 ante areas must be in separate rooms divided by walls and doors for compounding. Surfaces of ceilings, walls, floors, fixtures, shelving, counters and cabinets in a classified area or in a segregated compounding area must be smooth, impervious, free from cracks and crevices, and non-shedding, thereby promoting cleanability and minimizing spaces in which microorganisms and other contaminants can accumulate. Walls must be constructed of durable material (e.g., heavy-gauge polymer) and panels must be locked together and sealed. Floors must be overlaid with wide, sheet vinyl flooring with heat-welded seams and coving to the sidewall. Work surfaces must be constructed of smooth, impervious materials, such as stainless steel or molded plastic, so that they can be cleaned and disinfected easily. The buffer area or area inside the perimeter of a segregated compounding area cannot contain water sources or floor drains. RABS such as compounding aseptic isolator and compounding aseptic containment isolator glove boxes must be located in an ISO 7 environment for Category 2 compounding and the chemo hood/isolator must be located in a negative-pressure room measuring 0.01 inches of water column (wc), regardless of the volume compounded by the hospital. All hazardous drugs must be stored in a 0.01-inch wc negative-pressure room. The revisions define maximums for temperature (20 degrees Celsius) and humidity (60 percent). Viable air sampling must be done monthly and environmental surveillance for hazardous drug contamination is required. All health facilities that prepare sterile compounds are affected by the revisions to USP 797 and if hazardous drugs are being compounded, USP 800 as well. Given the extent of the revisions and the cost implications to hospitals, it is likely that the USP will open a second round of comments. Should that occur, the enforceable date of the new regulations may be no earlier than spring 2018. Start planning now. July 2018 is just over a year away, it takes a long time to make sure all the engineering and environmental monitoring are compliant. Many upgrades require a significant investment in planning, new construction or retrofitting of existing spaces, and financial resources. Conduct a gap analysis of the facility design elements. Cost has been one of the key barriers to compliance with USP 797 and USP 800. Understanding where the hospital falls short and the work needed to meet the new regulations will drive the budget discussions that need to start now. Get the C-suite on board. The investments in USP 797 and USP 800 compliance can prove costly for hospitals that are balancing capital investments that generate revenue with those mandated by regulations. But the cost of noncompliance, particularly if a contamination can be traced back to the hospital, can prove devastating. Demonstrating the importance of reducing risk as well as quality, safety and care benefits of USP 797 / USP 800 to hospital leadership and securing their financial, operational and programmatic support sends a clear message of the importance placed on compliance with the regulation. Identify a champion. Achieving compliance comes from having the support and buy-in of the C-suite, a team of stakeholders who represent the departments affected by and involved with sterile compounding, and a person dedicated to overseeing the quality monitoring and control activities of all aspects of sterile compounding. The importance of a USP 797 champion cannot be overstated. Those facilities that have a dedicated person are far more organized and more likely to achieve and maintain compliance. Enlist professional expertise. Complying with USP 797 and USP 800 can seem intimidating, particularly for older hospitals that face facility limitations. The OWEN Group brings a wealth of expertise, knowledge and information to facilitate the design, budgeting and planning process while assuring that the work will meet USP 797, USP 800 and BOP standards. Complying with USP 797, USP 800 and BOP regulations is a complex, challenging and lengthy process. Facilities that proactively take steps now to meet all current regulations and anticipate, plan for and act on the revisions on the horizon will be well-positioned to be compliant by the enforceable date.